Successfully Added Touchscreen Car DVD Media Center with Bluetooth (1-DIN) to your Shopping Cart. Our classic 1-DIN size (50mm tall) Touchscreen Car DVD Media Center with Bluetooth has a new firmware that enhances its digital media abilities while retaining all the features you loved before. With the CVEJS-400BT you can turn your car into a hands free multimedia center on wheels and never have a boring trip again! A high-quality + low-price multimedia solution for upgrading almost any vehicle, the CVEJS-400BT is an in-dash style unit that is only 1 DIN tall (50mm), so it can fit into almost vehicle while not interfering with other things in your dashboard. This model Touchscreen Car DVD Media Center with Bluetooth comes with a detachable faceplate and case so you can take with your or hide it under the seat and it even comes with a remote control so the passengers in the back can do things like change the radio or TV channel without having unsafely reach over the front seats. All those thoughtful design features are only the beginning of what makes the CVEJS-400BT one of the most popular single DIN car multimedia systems on the market today. Add in its ability to provide safe hands free phone conversations while driving, playback of music CD's, DVD movies, or home-made CD-R's, AM/FM radio with 30 station preset, analog TV tuner, 4 speaker high-power audio sound beauty, and a factory-direct price and you can see why this has been a constant best seller. This is the perfect multi media car entertainment center for either the resale market, OEM market, or personal/company use. As always, it is available direct to you from the original source for wholesale direct from China electronic products, Chinavasion. on 2011-01-16 00:07:20 The sound is very good, I recommend! The sound is very good, I recommend! Software is slightly modified, but you can use. The total score of 10-point scale - 8. Good machine for little money. Thank chinavasion.com for cheap products and good customer service. 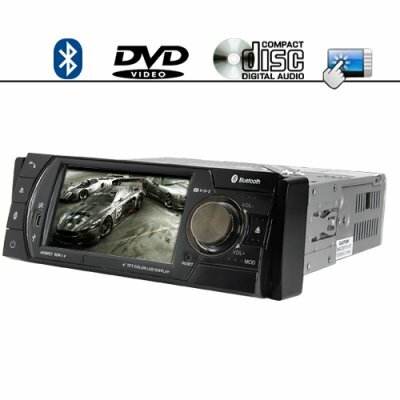 This DVD player is the best player once you want cheap but also with alsmot all function which you can expect from car DVD player. Only GPS navigation is missing. I'm second ovner of this palyer and it's running almost 5 years without any bigger problem. Only bluetooth is sometimes not able to pair with my phone, but once you reset the radio it's ok.
on 2010-02-16 00:57:45 Worth every penny. Very good quallity.Easy to use.Perfect fit for my sister's in law Peugeot 106.She loved it. Entra MUY rapida ,pedido el lunes entregado el viernes . Calidad excelente tanto sonido como dvd. Buen producto,calidad precio excelentes y muy rapidos en la entrega a Barcelona,espero comprar algo mas aqui, GRACIAS!! !